Spectators of the 7th and final qualifying round of the FEI World Cup driving in Leipzig were treated to thrilling competition that saw Switzerland’s Jérôme Voutaz drive with exceptional skill and ease to fend off tough competition from Glenn Geerts (BEL), and deny driving master Boyd Exell (AUS). The emotion evident for Geerts who made it to his first ever FEI World Cup driving final by a hairs breadth. 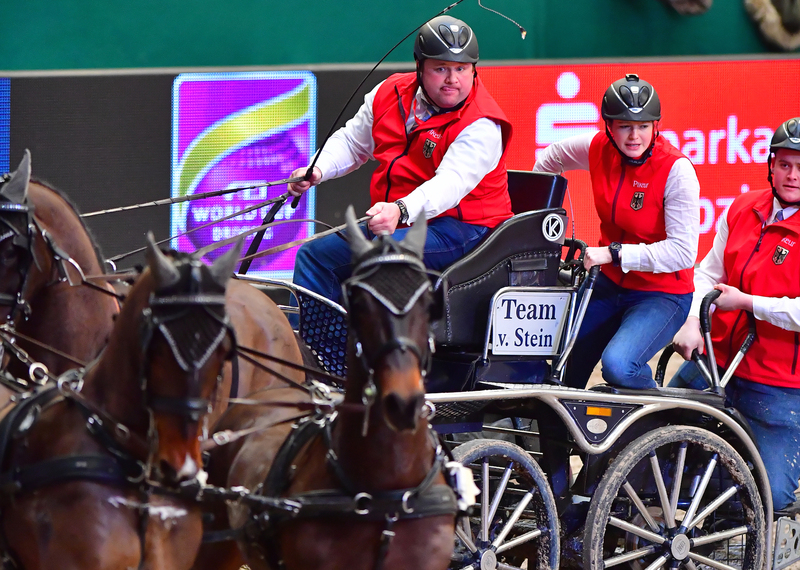 With only the top six drivers from the series qualifying for the FEI World Cup driving final, the tension was palpable as drivers made their last bid to secure those all-important points. Going into the competition Georg von Stein (GER) was lying fifth in the standings. Entering Leipzig as a wildcard entrant he was unable to pick up any more qualification points, instead only being able to deny his fellow competitors and spoil their FEI World Cup hopes. Two days, two clears he threw down the gauntlet for the rest of the field (149.62). The day wasn’t to be for Dutch stalwarts and former champions Ijsbrand Chardon and Koos De Ronde who finished 5th and 6th respectively. However, they had previously amassed enough points to secure a place in Bordeaux. 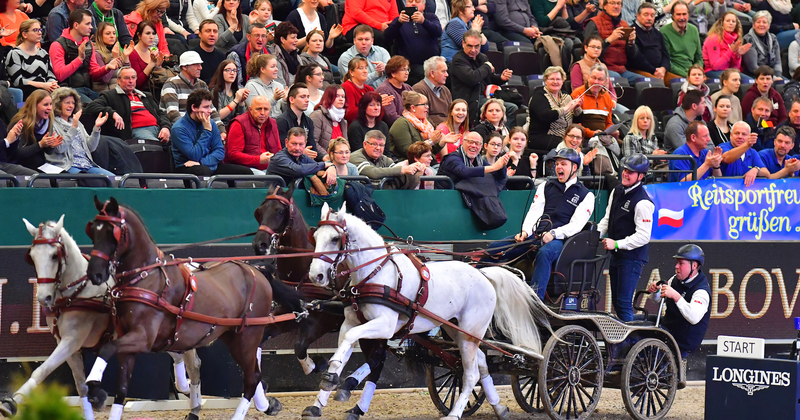 The atmosphere was electric as Geerts entered the arena, his hopes of a first ever FEI World Cup driving final riding on his next drive. Geerts had to finish at least second in Leipzig in order to have enough points to be eligible for the final. Before that he had to produce a faultless, perfect first round drive if he was to have any hope – and that he did. Flying round the course he posted a lightening time of 143.87, punching the air as he finished the course. The emotion clear, the relief evident, he had completed his first hurdle in making it to the drive-off. Voutaz, who didn’t let the clear rounds posted by Geerts and Von Stein affect his performance. He stormed the course to post 144, it was clear that Voutaz had more in the tank to unleash in the drive-off. The crowd went wild as the master, Exell entered, returning to the competition he won 12 months ago. He was already guaranteed a place in the final with three counting wins in the bag. A hesitation in a couple of the obstacles meant it wasn’t enough to beat the time of Geerts and Voutaz, resulting in a quick turnaround for Boyd in the drive-off. After getting off to a flying start, Boyd picked up five late penalties, opening the door for the remaining competitors to come (287.03). Voutaz capitalised on Boyd’s errors, looking controlled and at ease as he navigated Asendorf’s technical course. He faultlessly flew home in 278.45 across two rounds of driving, storming into the lead and securing his place in his third FEI World Cup final. It was now time for Geerts, the pressure firmly weighing on his shoulders, he would have to beat Boyd to make it to Bordeaux and deny von Stein the slot. In this make or break round he put everything on the line, unfortunately occurring a late five penalities. As the clock stopped on a combined two round time of 286.91, he had done it by the closest of margins. While he hadn't done enough to take the title, he had secured a place in his first FEI World Cup Driving final. The day belonged to Jerome Voutaz winning the all-important final qualifier and standing him in good stead as we head for Bordeaux. A thrilling culmination to what has been a gripping qualifying series. Exell, Voutaz & Geerts will be joined at the final by Chardon, De Ronde and Chardon, as Exell makes his bid for an 8th FEI World Cup driving title. However, with a line-up stacked with medallists and former champions, he could face his toughest challenge yet.